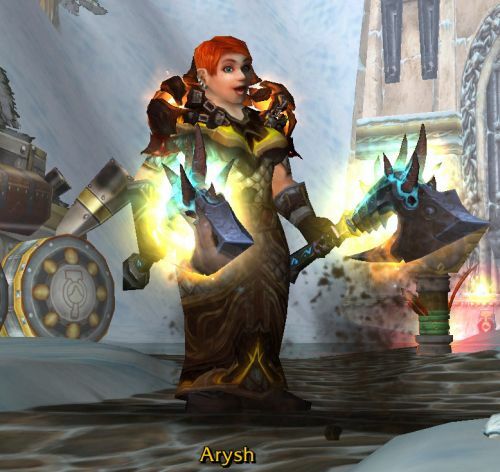 Meet The Girls: Arysh #WoW #WorldofWarcraft – Nomadic Gamers, eh! Arysh is my Dwarven Shaman, enhancement (melee dps) for the most part, restoration (healer) as her off spec. Playing a melee shaman is a LOT of fun, although you’ll hear it referred to as easy mode quite often because it’s a lot of casting unleash elements. Unlike Velours I’ve never had much luck when it comes to playing Arysh. She does have the two BiS (best in slot) raid finder weapons but it was not exactly luck that I won them. See they’re flagged as shaman / rogue only, and there were no rogues in the raid nor were there any shaman dps besides myself. There were some healers, but I have a role bonus. Aside from the awesome weapons she has two pieces of LFRaid set gear, and the rest is valor / twilight instance stuff that I’ve picked up. Arysh works on jewel crafting and inscription, which may seem like an odd combination but I have other characters who are able to provide her with the materials required (like the paladin, who provides herbs). Her story is quite simple. She was found left in a room at the local Inn of Ironforge. She has no idea who her parents were or why they left her but to be honest she never spends any time thinking about that. She’s constantly energetic and upbeat, and doesn’t regret a single moment in her life. She was raised by the Innkeeper and his wife who had 6 children, and her upbringing was filled with love, laughter, and a whole lot of noise. She spent a lot of time in the Mystic Ward of Ironforge, and when she was in her late teens she began developing her skills as a shaman. She’s one of the most loyal people you’ll ever meet, and one of the first people who will rush out to battle swinging her axes to defend a scored friend.